We love all things treehouse, and while there are many amazing, larger-than-life creations out there to admire, there’s something to be said for going small… really small. The Cottage Town huts from Ontwerpduo are a fanciful way to make houseplants and porch plants a miniature imaginative space to inspire kids — and to spark an interest in gardening. With slanted roofs, long ladders, and soft colors, the simple structures peek out from or perch in any gardening and planting container (including windowsills) and beckon little ones to imagine them as houses for fairies or other magical tiny creatures. We wouldn’t be surprised if some other fairy-sized furniture ended up in the planting pots too! The foldable houses are available in two sets (with each containing two different huts) and are made from waterproof paper, so watering is definitely still encouraged, even when done by slightly unsteady little hands. We love all things treehouse, and while there are many amazing, larger-than-life creations out there to admire, there's something to be said for going small... really small. 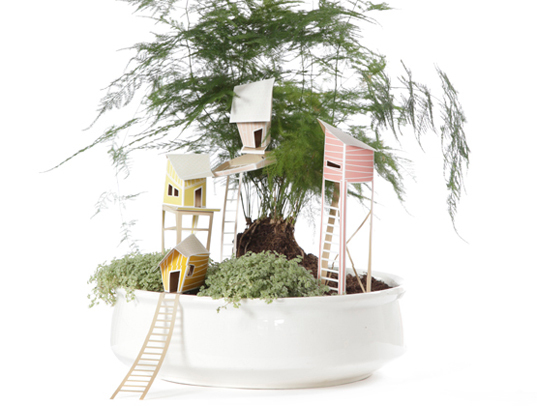 The Cottage Town huts from Ontwerpduo are a fanciful�way to make houseplants and porch plants a miniature imaginative space to inspire kids -- and to spark an interest in gardening. With slanted roofs, long ladders, and soft colors, the simple structures�peek out from or perch in any gardening and planting container (including windowsills) and beckon little ones to imagine them as houses for fairies or other magical tiny creatures. We wouldn't be surprised if some other fairy-sized furniture ended up in the planting pots too! The foldable houses are available in two�sets (with each containing two different huts) and are made from waterproof paper, so watering is definitely still encouraged, even when done by slightly unsteady little hands.